Sandy and Rhonda started Etoile in September 1988 in a tiny 1200 sq. ft. storefront on Ventura Boulevard, just across the street from our current location. We started as a gift and party store doing event and party decorating, gift wrapping and balloon bouquet and gift basket deliveries. We morphed into what we are today in less than 5 years, with the help and suggestions from friends and customers. After the Northridge earthquake in 1994, we moved into our 4000 sq. ft. location, feeling somewhat overwhelmed with it’s seemingly massive size. Today, we have 300 lineal feet of rental costume racks, with platforms built on the tops to accommodate rental hats, wigs and crowns; 325 sq. ft. of gridwall filled with retail costumes and accessories in all sizes and genre AND we still have to hang stuff from the rafters. We also have 2 storage containers filled to the brim and a storage unit with additional costume and accessory inventory. Did we mention that Sandy and Rhonda are sisters? Both born in Santa Monica and raised right here in Tarzana. Their family home, only blocks from the store, is still the gathering place for family and friends, and often used for extra storage when the Halloween season rolls around. THERESA was with us for over 25 years. She is still with us in spirit, after losing her 10 year battle with cancer. She was a loving wife and mother of 4 grown children, and grandma to 5 wee ones. We wouldn’t have known what to do every morning if we didn’t see her smiling face! Theresa was our morning manager during the week. For some reason she seemed to think she’d like to spend her weekends with her family, so you wouldn’t have found her around here on Saturday’s or Sunday’s. We miss her terribly! NINA is our resident Drama Queen…literally! 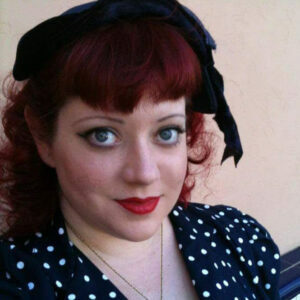 She’s an aspiring actress, screen writer and costume designer who has distinguished herself in the role of Magenta from the Rocky Horror Picture Show with the permanent shadow cast at the NuArt Theatre in Santa Monica. You can find her almost every Saturday night performing in the role. Nina also is a member of a Burlesque troupe she produces. She is a master at tracking down just the right look for even the most obscure character. So if you need some serious help with your costume, come in and ask for Nina! ABEL may look like a little kid, but she’s definitely not. She’s been with us for over a year and has proven to be a real asset. 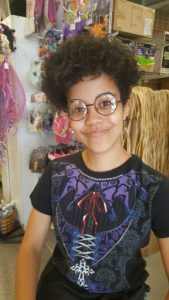 She is a huge Anime fan and can answer any questions you might have about how to look like your favorite Anime, Cartoon, or Comic Book character. She is also an accomplished artist and is attending classes after work to hone her skills. ALEX was born and raised right here in Southern California and has been in love with movies since the age of 9. She studied film production and film writing in college and film school, graduating in 2012 from the L.A. Film School in Hollywood. She currently freelances as a continuity supervisor; having worked with Al Yankovic and the late Martin Landau in her first feature film. In addition, Alex is a pole dance performer and athlete; having mostly performed among the burlesque and comedy communities. 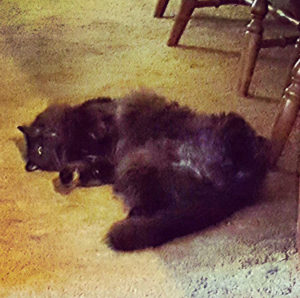 This furry beast is Nina’s big, lazy ball of floof (her words) that she adopted from a cat rescue suffering from an eye ulcer and ringworm…the kitten, not Nina. 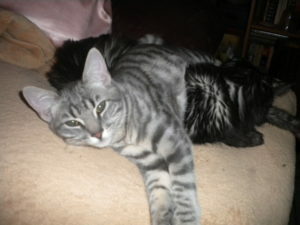 A frustrating month later, Pippin’s ringworm was gone and his eye had cleared up. His eye does flare on occasion, but she keeps a close watch to stay on top of it. He’s spoiled rotten and has breakfast with her every morning, stretched out on the back of the breakfast nook bench, no doubt to keep an eye on her. 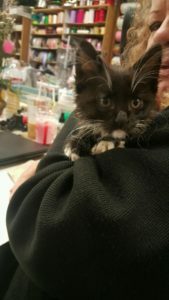 Nina spotted this sweet kitten in downtown L.A. being carted around in a basket by a homeless man who was swinging Oliver AND the basket wildly, causing Nina to take action. After much discussion and pleading and cajoling, she was able to get him away from the man and gave Oliver a forever home with big brother Pippin. 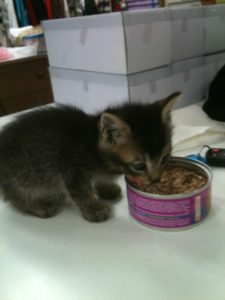 He was so young that she fed him with an eyedropper for several weeks, until he was old enough to eat on his own. He’s grown into one handsome devil! SHERLOCK belongs to Abel and certainly looks to be one happy rescued pup! Abel’s short bio on Sherlock turned into a novella, so I’ll paraphrase. 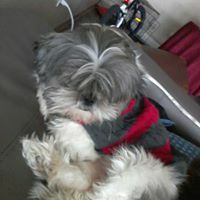 Sherlock is a ShihTzu mix. He was one of 2 puppies left from a litter and they looked awful. Matted, skinny and flea infested. The first puppy was a little hyper, so she moved on to the second, who settled into her arms with a big puppy sigh. That was it! She says Sherlock looked a bit like Doc from Back to the Future; a tiny Mad Scientist with his tufts of matted hair. He now sleeps contently on her head at night and tries to suffocate her with his fur…but that’s LOVE! 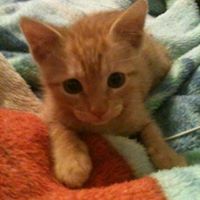 TIGER LILY wasn’t really rescued, but she was taken in from Rhonda’s niece who just didn’t have any more room for another kitten. Lily tormented big sister Gabby, as you can see by this pic of Lily lying on top of her while she’s trying to sleep. 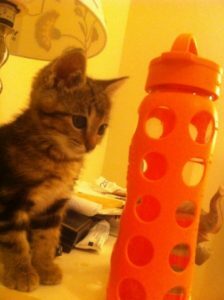 She was nick-named BEAST KITTEN because she was a relentless troublemaker. Gabby learned to tolerate her and even groomed her occasionally, until she passed about 2 years later at 16. LUCY (IN THE SKY) was found one early one morning, all alone, crawling up the screen door of a friend of Nina’s, demanding to be let in; but she, couldn’t keep her. Rhonda had room for another, so she brought her home to meet her big sister Lily. We’ve all heard of Karma? Well…Lucy is Lily’s Karma. At 2 years old, Lucy still badgers and provokes Lily. But you can often see them snoozing together or grooming one another, so they do love each other. Lucy was very young when Rhonda adopted her and even though the vet told her she’d probably grow out of her need to suckle and knead, she still crawls up on Rhonda at night and suckles the sheet while kneading and making cute whiny noises until she falls asleep. GRYPHON was spotted living under one of our storage containers behind the store one day. We started putting out kitten food for him every night. He didn’t seem to be afraid of us, so it only took a couple of days before we were able to catch him and send him along to his forever home with Sterling, one of our former employees; who says he is a happy Snuggle Bug. 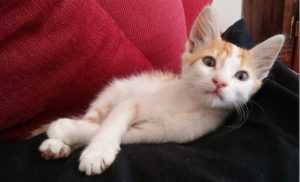 BINNIE was another kitten found living alone under the same storage bin, thus the name Binnie. It took us a couple of weeks to catch him, but if we were late giving him more food in the morning, he’d stand outside the back door carrying on like he was starving; even though we left food every night. Rhonda spotted this cutie one day bouncing along behind a very young mama, who one day just wasn’t there any more. Binnie was only about 7 weeks when we caught him, flea infested, with a bur lodged in his eye, but he has grown into a beautiful adult cat living with a friend of one of former sales associates; who really wanted to keep him, but, alas, her sister was allergic. We never did have a chance to name this sweet little girl. She was the first kitten we found under the storage bin years and years ago. One of the ladies in the medical building across the alley spotted her first, so when we finally caught her, this caring soul took her home. 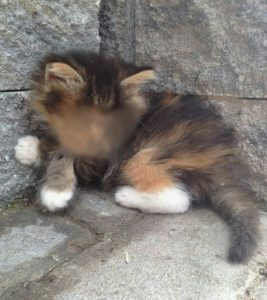 PHANTOM KITTEN has alluded us for weeks now. Nina’s the only one who has actually seen it, but only a flash of a tortoise shell tail scurrying around a corner. We’ve been leaving food every night, which is always gone in the morning; but, for all we know, we’re feeding a family of opossums or raccoons having come down out of the foothills to dine. I’m beginning to wonder if, perhaps, Nina wasn’t hallucinating that day??? DEXTER isn’t one of our rescues, but belongs to Rhonda’s good friend Pam, who lived in Colorado when she adopted him; and now lives in the Lake Arrowhead area, but soon to move either back to Colorado or maybe Arizona. 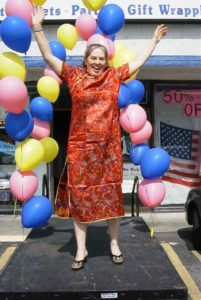 Pam was out shopping one day when she came upon a pet adoption outside a market. 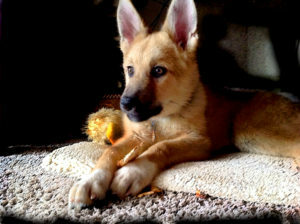 They were breaking down for the day and there sat this sweet Shepard mix…the only one left. Pam took one look and decided she couldn’t just leave him to go back to a kennel somewhere, so she “Paid the Lady” and took him home. 2 hip replacements later, he is in tip top shape and a happy, happy guy. AND, quiet and well behaved. I’m here to tell you, he is one gorgeous furby! Just look at that face!